Vengeance is sought now that 300: Rise of an Empire has been released onto Blu-ray 3D Combo Pack, Blu-ray Combo Pack, DVD Special Edition and Digital HD by Warner Bros. 300: Rise of an Empire, told in the breathtaking visual style of the blockbuster 300, is a new chapter of the epic saga, which takes the action to a new battlefield - the sea. The story pits the Greek general Themistocles against the massive invading Persian forces, ruled by the mortal-turned-god Xerxes, and led by Artemisia, the vengeful commander of the Persian navy. Knowing his only hope of defeating the overwhelming Persian armada will be to unite all of Greece, Themistocles ultimately leads the charge that will change the course of the war. I remember watching Zack Snyder's 300 and thinking that I had never seen anything like it but it really took me awhile to decide how I felt about it. I loved the stylized action but was a little put off by the copious amount of blood and gore throughout the movie. Despite those reservations, I really liked the movie and Gerard Butler's star making performance. Considering how the movie ended, I wasn't really expecting to see a sequel to it since pretty much everyone died in the first movie, but everyone involved in the making of 300: Rise of an Empire cleverly found a way to get around that by making this film take place at the same time as the first movie and then dovetail the events to follow a little after the first film. It's a brilliant approach and I wish others would start doing this instead of the now predictable prequels instead. It's funny that the issues that made me pause the first time - the excessive blood and gore - are even more prevalent in this movie, as if the director Noam Murro and his crew thought that they needed to outdo the first film in every way which means that about every shot has some digital arterial blood spraying everywhere. It's so prevalent and outlandish that it gets kind of silly and it reminded me of the Julia Child sketch from "Saturday Night Live" with Dan Aykroyd that also had over the top blood spurts after an accident in the kitchen. Whenever something is overdone, it begins to numb the audience into indifference and worse in some cases - boredom. That doesn't quite happen here since the fight sequences are well staged and exciting to watch, but I do wish they had toned it down, which I know is a crazy statement to make about a 300 movie which has been designed to be the personification of excess. 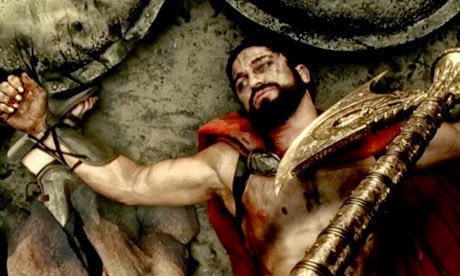 When the movie starts, we get a flashback to the ending of the first film and sadly our last brief look at King Leonidas (Gerard Butler) before his opponent the self-proclaimed God Xerxes (Rodrigo Santoro) chops his head off before going to destroy the rest of Greece. 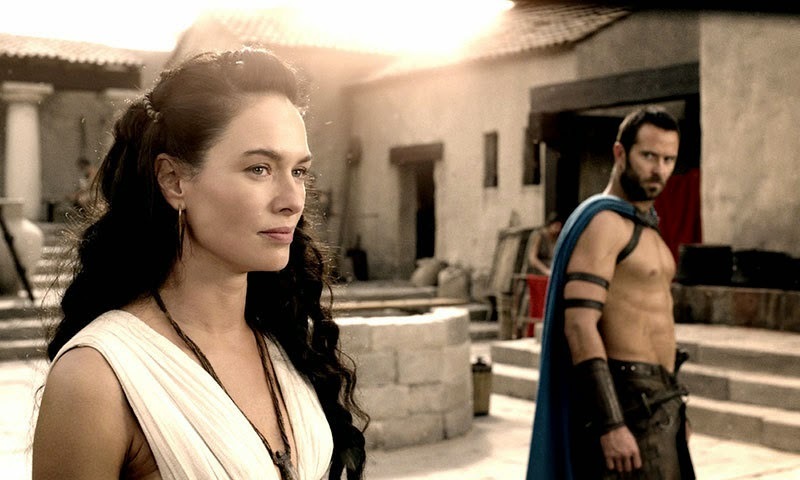 Then we get a time jump and some narration from Queen Gorgo (Lena Headey), one of the few who survived the first movie, who narrates an earlier battle that involves Xerxes' father King Darius (Yigal Naor) getting killed by General Themistocles (Sullivan Stapleton) of Athens. 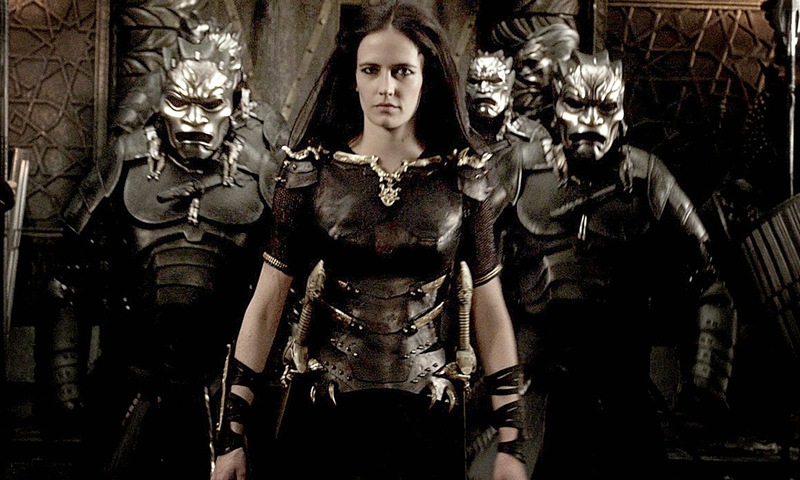 That sets off a chain of events that leads to the 300 Spartans getting killed after Xerxes is manipulated into believing he is a God by Darius' advisor Artemisia (Eva Green) who tells him that he must destroy the Greeks. It's at this point that the movie begins running parallel with the first movie as Xerxes army begins to march towards Thermopylae and their encounter with the 300 Spartans. 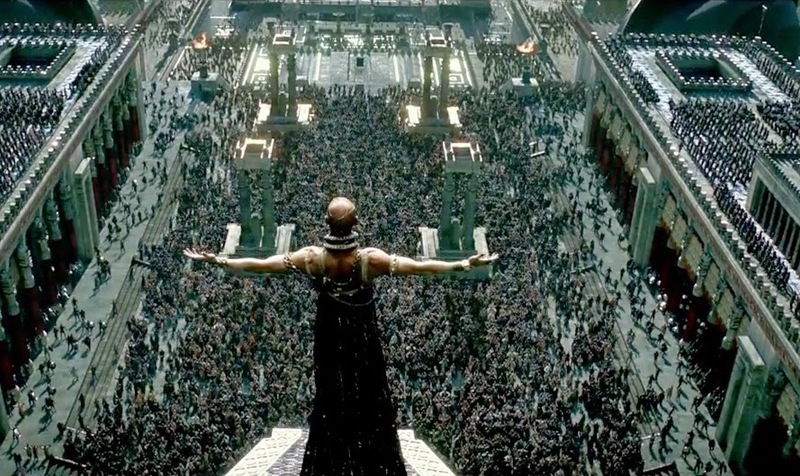 In Athens, Themistocles convinces the ruling council to allow him to lead a fleet to engage the Persian at sea and then travels to Sparta to ask King Leonidas for assistance. When he arrives there, he is met by Queen Gorgo who informs him that Leonidas is away conferring with the Oracle and that they have no interest in joining the Athenians since they will soon have their own battle to wage. So as the Spartans delay the Persian advance at Thermopylae with their lives, Themistocles takes the battle to the Persian on the sea by ramming their ships before retreating back to safety. His strategy is to do hit and run battles against them to counter their superior numbers. Of course, Artemisia is intent on putting a stop to his success and to avenge her King's death and it's only a matter of time before they have a huge confrontation of their own. Unlike the grounded battle of 300, the biggest clashes in this sequel all take place on the water and it's pretty spectacular to see. It's even more impressive when you factor in that none of it is real as the whole movie was filmed in front of a green screen. The ships crash into each other, ride monstrous waves, and thanks to Artemisia's tactics of using tar and fire, they also explode violently. All of that combined with wave upon wave of vicious hand to hand fighting really ups the ante from the first film. The main drawback is that none of the characters engender the same kind of audience loyalty as the first film's did. To use a "Star Trek" reference, this film is filled with red shirts on both sides of the battle who exist only to be either killed or maimed horribly. 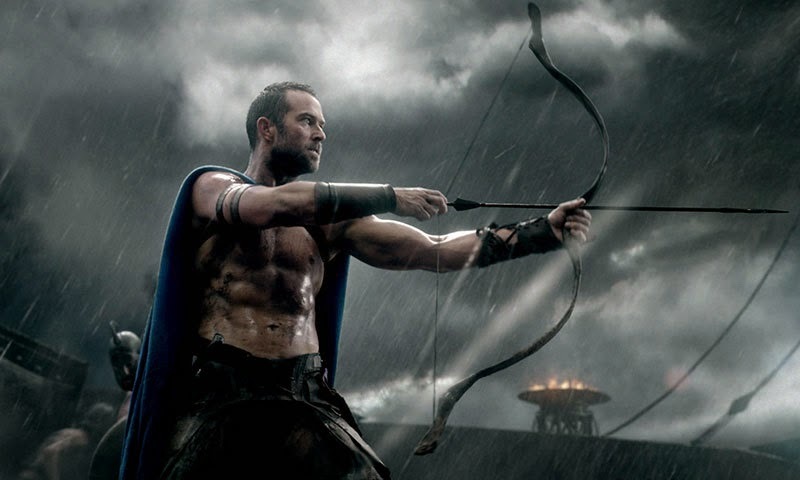 The only real standouts are Sullivan Stapleton who's a far more reserved character than King Leonidas ever was, and Eva Green who is the best thing about this movie. I've been a fan of Green's ever since Casino Royale, and every film since then she has excelled in each role. This role is no different as she delivers a fierce performance as Artemisia who has a very personal reason to hate the Greeks (although it's not historically accurate at all, nor is her character's fate). Green is spectacular in every way in this film and it makes me hope that she gets an even bigger role in her next film. It was also nice to see David Wenham from the first film make another brief cameo here. 300: Rise of an Empire isn't as good as the first film, but it does have a lot of good moments in it and while it does continue the look and approach of the original, it's not afraid to try new things which is always a good thing for a sequel. While there's no shortage of unbelievable sequences (especially the ending), that's been a part of this series from the beginning so if you enjoyed the first movie, odds are good that you will enjoy this one too. This 1080p (2.40:1) transfer looks gorgeous, with an amazing image that captures all of the film's beauty and blood in a pristine detail. The colors on a whole are desaturated by design as part of the overall aesthetic style carried over from the first film. The only exception is the ever present red blood that's vivid and everywhere. Detail is very impressive as you can see every droplet of blood, every whisker, and even the textures of the uniforms in perfect clarity. Black levels are incredibly dark and inky and the contrast is spot on as well. This pristine transfer is simply amazing on every level. I wish I could have seen how the 3D version turned out too. Rise of an Empire's DTS-HD Master Audio 7.1 mix is just as incredible as the film's video quality. This is one of those mixes that's guaranteed to shake the house and get your wife mad at you. The LFE is a constant presence as it thunders non-stop thanks to the many explosions, sword slashes, and the shattering of wood from the ships crashing into each other. It's impressive that the dialogue is clear and easily understood despite the constant carnage, but it somehow does it. The rear channels offer some extremely accurate cross channel action that swirls around the viewer. The score is also well balanced with both the vocals and the cacophony of the sound effects. This is an awesome mix that you will have to experience for yourself. Just make sure your wife isn't home! The extras included were all interesting but I wish they had included more of them. All of them are in high definition. Behind the Scenes: The 300 Effect - We get a thirty minute featurette that's been broken into four parts: "3 Days in Hell," "Brutal Artistry," "A New Breed of Hero," and "Taking the Battle to Sea." In these we learn how the film came about with interviews with Zack Snyder, Noam Murro, and some of the cast and crew. We also see how the visuals for the film were created along with the actual sets, props, and costumes, with some comments from designer Patrick Tatopolous. He mentions how he kept some things from the original movie but enjoyed also taking it in a different direction with the ships for the sequel. Speaking of the ships, we also see how the naval battles were created which is pretty interesting. Real Leaders & Legends - Lest anyone actually think that this movie's recreation of past battles resembles actual history, this twenty-three minute featurette should clear some things up for viewers. While the names of the people involved, the look of the ships, and the tactics used during the battles are true, the rest is all made up. We also learn more about the actual people from history like Themistocles which was pretty interesting. It made me do a little research on my own which revealed that he actually later become exiled from Greece and ended up convincing Xerxes's son to let him be a Governor of one of the Persian towns! And Artemisia also has an entirely different fate than the one shown in this movie. Women Warriors - This featurette is devoted to Eva Green's Artemisia and Lena Headey's Queen Gorgo and their characters' roles as fierce warriors and leaders in a male dominated society. Both actresses talk about their roles and how much they liked playing strong women. Savage Warships - A look at the the ships and strategies of the actual navies that took part in the real battles and how they were recreated for this film. Becoming a Warrior - A quick look at how the cast trained for their roles since you need to be in great shape if you want to be in a 300 movie. 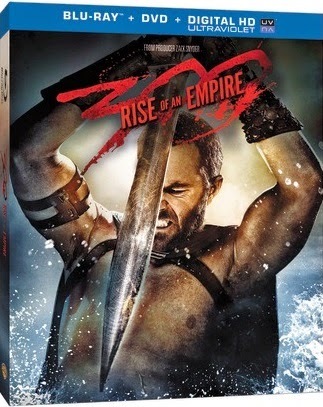 300: Rise of An Empire is a fun continuation of the 300 series but it's not as good as its predecessor despite its attempt to top the original movie in every way. The cast is in fine form (especially Eva Green who is the best thing about the movie), but it's missing the charismatic Gerard Butler who made the first movie so entertaining. I do like that the movie went a different route and made a sequel that runs parallel to the first movie before it becomes an actual sequel in the last act of the film. I also enjoyed the sea battles which are well staged and something new to the series. The Blu-ray offers top notch video and audio quality which combined are more than enough reason to recommend this Blu-ray, which is good since the extras are fairly limited although interesting. If you enjoyed the first film, there you will most likely enjoyed this one too as I did.